It’s rare to find a company that has been in business long enough to have completely transformed the way it does business, and still thrive in what is an increasingly dynamic and demanding consumer market. Yet Pillow Talk has done just this, evolving from being the first company to introduce Australians to the continental quilt four decades ago, to a leader in digital marketing and personalised content delivery during its current brand relaunch. After celebrating 40 successful years in business, the Brisbane-based retail stalwart has transformed the look of its brand, stores, logo and mantra, with comfort at the core. Also at the heart of the rebrand is data and the kind of consumer insights considered impossible for the traditional bricks-and-mortar retailer even half a decade ago. About three years ago, Pillow Talk decided to talk to its employees and customers, and received lots of conflicting information. The team realised the online customer was aged 22-35, while the in-store customer was aged 45-75. “We realised there is a warning signal there, because business is still 92 per cent bricks-and-mortar. 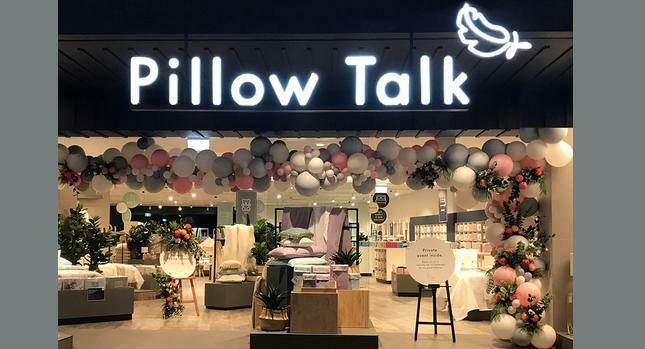 So we needed to make ourselves appear more relevant to a younger consumer,” co-founder and managing director of Pillow Talk, Heath Goddard, told CMO. The year before, the company had engaged Alpha Digital to combine and leverage its data to provide in-depth customer insights. Alpha Digital and Pillow Talk have now used four years’ worth of insights gained from the digital audience to develop the digital amplification of the customer-centric relaunch. The insights have also proven invaluable throughout Pillow Talk’s current omni-channel brand strategy. Pillow Talk digital marketing manager, Kristy Stevens, said since working with Alpha Digital, its digital platform and reach has grown significantly. “The data and insights and making our messages much more targeted have been invaluable, and we’ve seen great result,” she said. “Personalisation needs to be at the core of everything we do, because customers expect and deserve to get a one to one relationship with our brand. “Adding that level of personalisation to present products, information, items and content customers actually want to absorb is essential." One of the surprising insights gleaned is the fact customers want more content from them, rather than less. “The biggest thing can give to our customers at the moment is content, they actually want more information. People are content hungry. They want to know why they should choose down over wool,” Stevens explained. “Part of our strategy now is understanding what areas they want to consume more content in, and producing relevant content that answers their questions in an easy way. We must present it in a way they can absorb and understand, and put into practice. And this is not just online. “This can be one of the most difficult things to nail as a marketer. We want to give the right info but don’t want bore them or be too salesy." Ultimately, it’s important to take the next generation along with the brand and introducing them to stores is a crucial piece of the puzzle. “We are focused on being dynamic, and talking to customers on a one-to-one level. We now recommend products based on sleep style, we are using our data to present products tailored to what we know about them," Stevens said. Goddard agreed business evolution must occur, and every company goes through a metamorphosis. This in turn has led to the rebrand, as well as a different feel in-store, and a removal of excessive ranging. “We were among the first to do online back in 2000, but it didn’t work for us. Until we got it right, we didn’t want to do it again and under-deliver. So we relaunched 15 months ago and have had between 60-70 per cent growth each year since then online,” he said. “We’ve reorganised the layout in two stores, and those stores now trading better than the others. “We have videos pushed back through digital channels, and our online department has doubled, as had our fulfilment structure, and even our packaging. Pillow Talk also has a new logo, featuring a feather perched where the red ‘dot’ has been for the past four decades, signifying its commitment to the universal human truth of seeking, treasuring and sharing comfort. Pillow Talk general manager, Kate Spencer, said comfort is at the centre of the brand’s purpose. “Comfort. It’s such a simple, humble idea that stretches the breadth and width of humanity. I’m so very proud that at Pillow Talk, we can celebrate such a universal human need with the conviction and authenticity that a subject of this importance deserves,” she said.